figured out how to add music! now you can listen to some of our demos here. if you want more, don’t worry! we’re in the process of recording new tracks with Curtis Chaffey. stay tuned. also, thanks to the Boys of Bytown, the facebook event for our next show is up. this time, we’re headlining (!!) the “Women and Eclectic Sound” event at Cafe Nostalgica on Monday July 4, held as part of Women’s World 2011. We’re excited to be a part of this global feminist conference and even more excited to have an evening full of lady musicians and their lovely lady sounds. so come by and check out this FREE show. the party starts at 7PM and ends by 11PM, so all you government working stiffs can be up in time for work the next morning, with your ears still ringing from great music. finally, we’ve got some big announcements coming soon. my good friend (and former high school bandmate) mike kuehn has created this brilliant mashup of Andrew W.K. and the Beach Boys, which he has titled “Brian W.K.” i highly suggest you check it out. new photos from our Rasputin’s Beard gig at the Masonic Hall are up, courtesy of Kate Morgan. bonus: Gloria appears to have jowls. Thanks to everyone who came out to catch our acoustic performance last night at the Masonic Hall for Rasputin’s Beard. Especially to our parents who stayed up past their bedtime to finally see what their daughters were up to. And also to the Newport Restaurant for making us feel like rock stars by randomly giving us a FREE PIZZA. oh yeah. We felt super lucky to have taken part in this special evening and were very happy to meet the Ottawa folk musicians that make up the Spirit of Rasputin’s community. 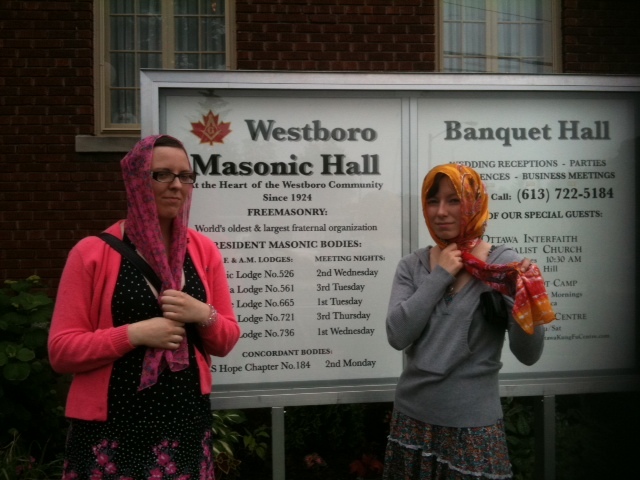 also, it was just pretty darn awesome to play at the Masonic Hall. despite the raging headache i had from celebrating St-Jean-Baptiste Day last night in Gatineau, i got up early to bake some Scary Bear cupcakes for our Rasputin’s Beard show tonight at the Masonic Hall in Westboro. tonight, not only can you look forward to these delicious free cupcakes portraying extreme cruelty against animals, but also our brand new song called “I’d Like It Better” we’ll be playing in celebration of the gay marriage bill passed last night in New York. it’s gonna be a pretty neat show in general, different from our usual ones int hat it’s going to be stripped down, acoustic, and featuring lots of glockenspiel. we’ll also have our sweet t-shirts available for sale. so make sure you come out tonight! (yes, we said “come out”). had PMS. got drunk. made a website.